Three weeks ago, we were on the wine tour in Walla Walla that I wrote about in my posts titled Walla Walla 1, 2, and 3. These covered our drive over there and our two days of winery touring. I never wrote Walla Walla 4, about our drive home. But, to the extent that a fourth post about the trip was needed, my friend Russ has now been kind enough to supply it, at his blog Stance and Balance. Russ offers several valuable complements to my account, including a link to this charming story about our wine guide extraordinaire, Philippe Michel. Recall that Philippe owns Oak Tradition, purveyor to the industry of barrels and more. Now that I’ve returned to the subject, I’ll fill you in on the last day of the trip. We began it at the breakfast buffet in the dining room off the Walla Walla Hampton Inn lobby. Once again, we were surrounded by Little League baseball teams from suburban Seattle, in Walla Walla for a statewide tournament. On getting food and taking seats, I filled Gail in on some remedial reading I had done the night before about French wine regions, and my thoughts on where the Walla Walla wines fit into this picture. I then mentioned a winery we visited in north Sonoma County on our Healdsburg trip four years ago, Silver Oak, maker of high end Cabernets. I recalled that this is all they made, but Gail thought they made merlots too. We went back and forth on this, until a fellow sitting alone two tables away intervened, assuring us as a long-time Silver Oak customer that they make both. This was a special moment, one of those rare occasions when Gail could shut me up by appeal to a higher authority. She was very happy. As Gail drove, Cynthia and I did independent research on our phones, finding no evidence that Silver oak makes merlots. So there! I may be a pompous blowhard, but I also may be right! Whitman is the premier liberal arts college that combines academic excellence with an unpretentious Northwest culture and an engaging community. Since becoming a college in 1882, Whitman College has a history of graduating ethical, accomplished leaders. The tree-lined campus is home to an intellectually dynamic, diverse, active and supportive community. Students find a balance at Whitman between challenging academics and developing meaningful and enduring personal relationships through an involved campus community.”>Whitman is the premier liberal arts college that combines academic excellence with an unpretentious Northwest culture and an engaging community. I didn’t know much about Whitman when I moved out this way a few decades ago. In fact, I probably knew nothing. But I learned quickly. One of my best and most engaging students that fall turned out to be an alumnus, having come all the way from Hawaii to attend it. Since then, I’ve met many alumni, and a colleague of mine moved there a few years ago to become the president. I wasn’t about to leave town without visiting. On the other hand, we had a deadline. I needed to be back in Seattle and on campus by 5:00 PM. Thus, as much as I wanted to see the sights on our way home, we couldn’t linger anywhere. The result was that we drove around the edges of the campus, parked, wandered into a big grassy area surrounded by dorms and academic buildings, then returned to the car and headed out of town on Highway 12. In 1836, a small group of Presbyterian missionaries traveled with the annual fur trapper’s caravan into “Oregon Country”. Among the group, Narcissa Whitman and Eliza Hart Spalding became the first white women to travel across the continent. Differences in culture led to growing tensions between the native Cayuse people and the Whitmans. Their mission became an important stop along the Oregon Trail, and passing immigrants added to the tension. A measles outbreak in 1847 killed half the local Cayuse. Some of the Cayuse blamed these deaths on Dr. Whitman. Dr. and Mrs. Whitman were killed along with eleven others; Forty-seven other mission residents were taken hostage. The deaths of the Whitmans shocked the country, prompting Congress to make Oregon a U.S. territory, and precipitated the Cayuse War. In more recent times, the site has been excavated for important artifacts, and then reburied. 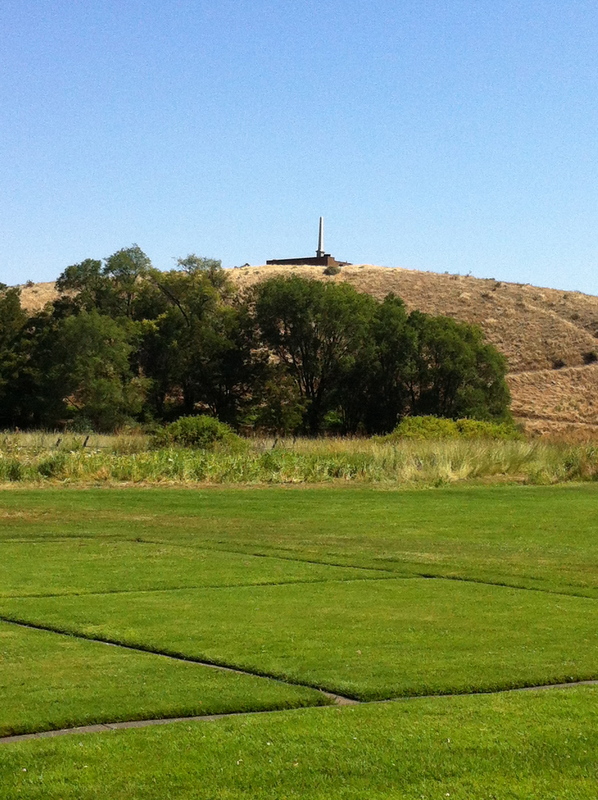 A memorial obelisk, erected fifty years after the event, stands on a nearby hill. The historic site was established in 1936 as Whitman National Monument and was redesignated a National Historic Site on January 1, 1963. The site has a park building with a small museum and an auditorium. Out back, a hundred yards behind the building, is the mission grounds, with the shape of each mission structure outlined in stone where it actually stood. A walkway loops around, with signs explaining what’s what. For instance, as you look at the plan of the Whitman home, you can see where Marcus was shot, and where he died after running outside. There’s a path leading back to the hill and the memorial obelisk. Our friend Julie had told us the day before that one of the really cool things at the site is the Oregon Trail wagon wheel tracks. Gail mentioned these to the ranger when we first arrived, and she quickly disabused us of the notion that they’re real. After talking with the rangers, we split up, Gail and Cynthia checking out the exhibits while I watched the ten-minute video. I thought the video gave a good overview, so I urged them to see the next showing, during which I visited the exhibits. Then we headed out back, looked at a stagecoach that’s on display, went farther back to the mission site, and took the loop. We had been lucky with the weather the previous two days, but this was going to be a hot one, and it was already hot and humid. Between that and my hurry to get back to Seattle, we didn’t linger. We will next time. Back on Highway 12, we reversed our route of three days earlier that I described in my first Walla Walla post. West to meet the Columbia River at the Wallula Gap, northwest and west along the Columbia to the Tri-Cities, through Pasco (with Kennewick on the other side of the river), over the river into Richland, then a climb out of the Columbia River Valley and on to the Yakima Valley. Once in Prosser, the easternmost Yakima Valley town and a major wine center in its own right, we stopped for lunch. Had I not been in a hurry, we could have visited — among others — Hogue Cellars, Desert Wind Winery, or Kestrel Vintners. Instead, we filled the car with gas, then went looking for a restaurant where we could get excellent food with minimal wait. And you know what? We found just what we needed, right at the corner of Merlot Drive and Chardonnay Avenue. A place called Subway. It’s pretty cool. You go in, choose your bread, choose your meats and cheese, choose whether or not to have the sandwich toasted, then you get to select all these vegetables: lettuce, tomato, onion, olive, pickle, several kinds of peppers. And what an assortment of spreads! Different mustards, mayo, oil and vinegar. Bottles and bottles filled with options. Plus, it’s really good! The staff is friendly. The lighting is warm. They have — get this — wallpaper with New York City subway maps. It’s great fun. I’m going to have to see if there’s any place like it around here. We left filled and happy. Soon we were nearing Yakima, and the cherry stand Tobae had discovered through an internet search the night before. We pulled off. They had four varieties of cherries, plus peaches and assorted other fruit. Everything looked and tasted good. We bought several pounds of cherries, then continued our journey. In Ellensburg, we switched drivers, Gail taking us the final 110 miles into Seattle. There was traffic on I-90 once we got into Bellevue, slow going across Mercer Island and through Seattle, then we got off onto local roads for the final stretch. Home at 4:45 PM, just in time for me to unload our wine from the car and head to work.